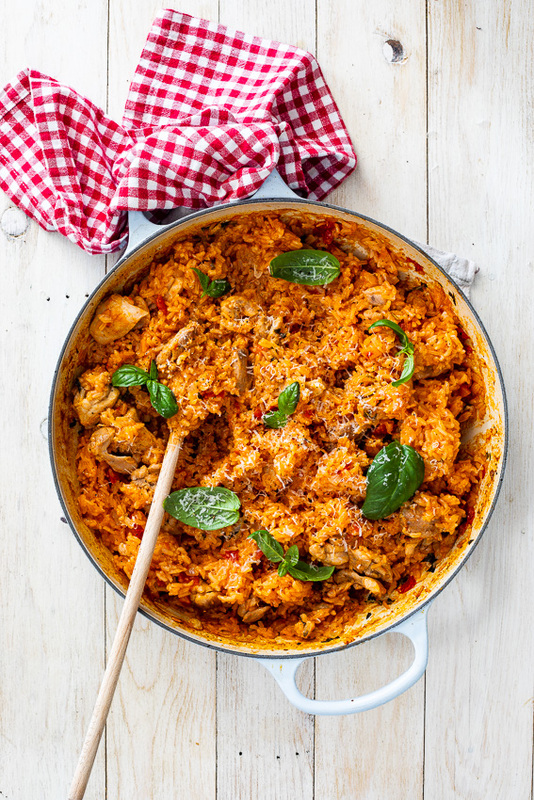 Easy one pot tomato basil chicken rice is the kind of weeknight recipe your dreams are made of. 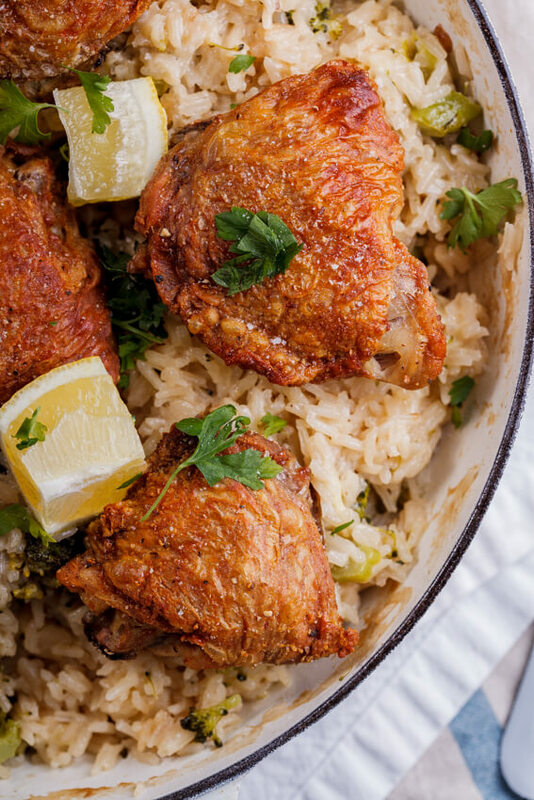 So easy, so delicious and clean plates are guaranteed. This is how I know if a recipe has been received well by my kids lately: Aidan will proclaim loud and proud “there is not a single thing left on the plate!” while holding the plate in the air. And he did exactly that when I made this easy one pot chicken rice again last night. And he wasn’t the only one, I practically licked my plate not wanting to waste any of the deliciousness. I am a huge fan of risotto but during the week I just don’t have the time to stand stirring a pot of rice for 30 minutes. I need to get dinner going and then sort out the kids (or just have a G&T in peace…). 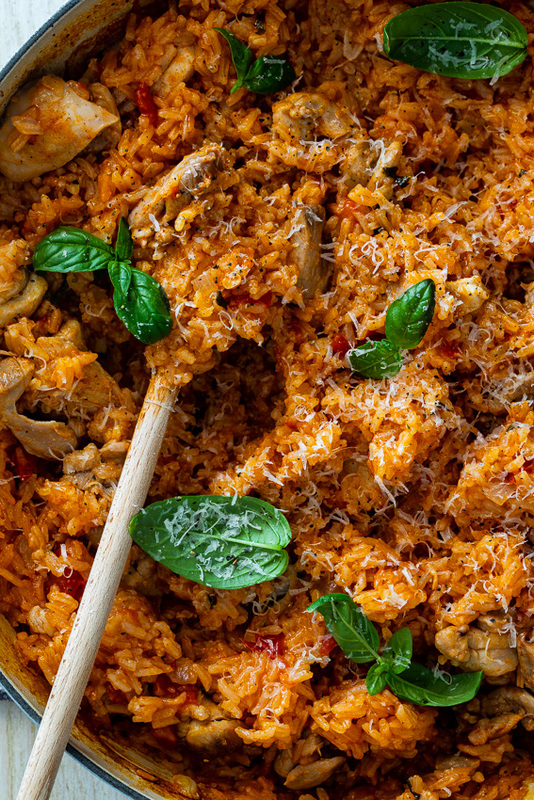 This chicken and rice recipe with all those glorious tomato and basil flavors gives me the satisfaction of a glorious pot of risotto with a quarter of the effort. Plus, the leftovers are awesome the next day! 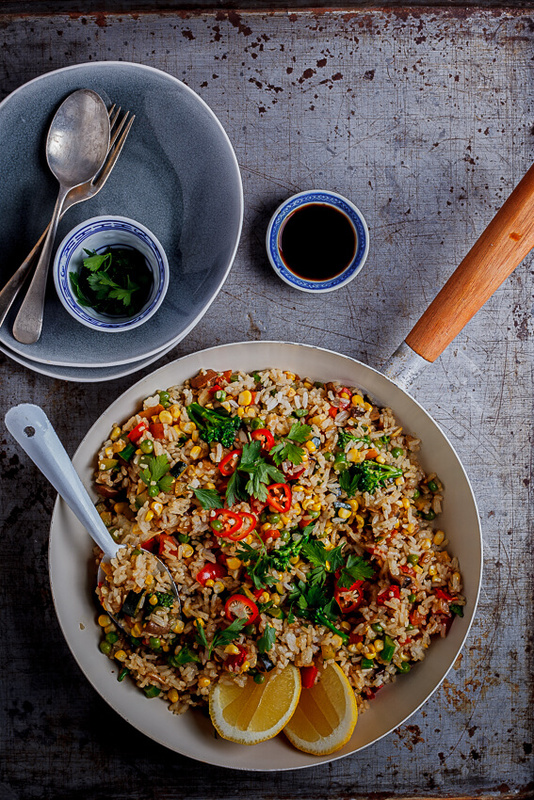 Because this is a one pot wonder, you need to start with a nice big, deep pan. I use my trusty buffet casserole but any large sauté pan will work well. I browned the chicken thighs well before removing them from the pan and sautéeing onion and garlic until fragrant. I used Jasmine rice but Basmati or short grain rice will work just as well and then I added white wine, canned tomatoes and chicken stock. 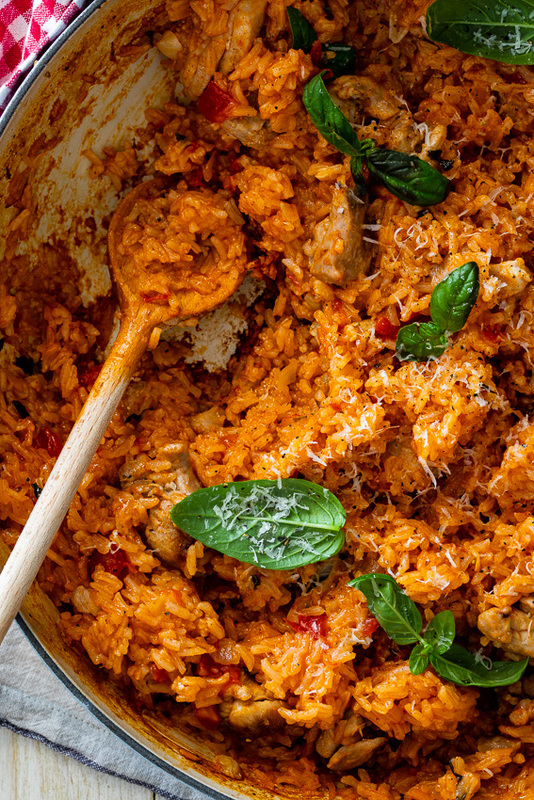 I also added chopped basil because I wanted to infuse the rice with its delectable flavor. Add the chicken back in, cover and allow to simmer until the rice is cooked. Finish with Parmesan and fresh basil and you’re done. You can serve this recipe with a simple green salad or go simple and serve it as is from the pot. Then watch it join the “Clean Plate Club” in no time! In a large, deep frying/sauté pan, heat a splash of olive oil then brown the chicken on all sides. Remove from the pan and add the onion and garlic and sauté until fragrant. Add the rice and white wine, allowing the wine to reduce while deglazing the bottom of the pan. Add the chopped tomatoes, chicken stock and tomato paste with the basil and season generously. Place the chicken on top of the rice. Cover with a lid and reduce the temperature. Allow to simmer for 15-20 minutes or until the rice has absorbed all the liquid and is cooked to your preference. Adjust the seasoning with salt, pepper and lemon then serve with fresh basil and grated Parmesan. A GnT in peace love it! 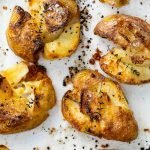 This recipe looks heavenly! Definitely going to make this one 🙂 Yum Yum! 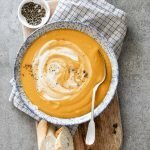 This is a comfort food dish I could eat all fall and winter long Alida! I know my family would enjoy it too! 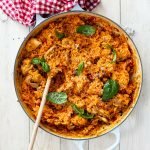 I love a good one pot and this has all the flavours I’ve been craving recently so definitely need to give it a go! I hope you like it Amy!